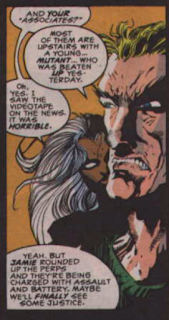 As a contingent of X-Force prepares to head to New York to find Cable, Xavier is rushed to the hospital. As various members of X-Factor & the X-Men gather, Havok sends Wolfsbane & Strong Guy out to check the scene of the crime themselves. Shortly thereafter, X-Force arrives at the same spot. 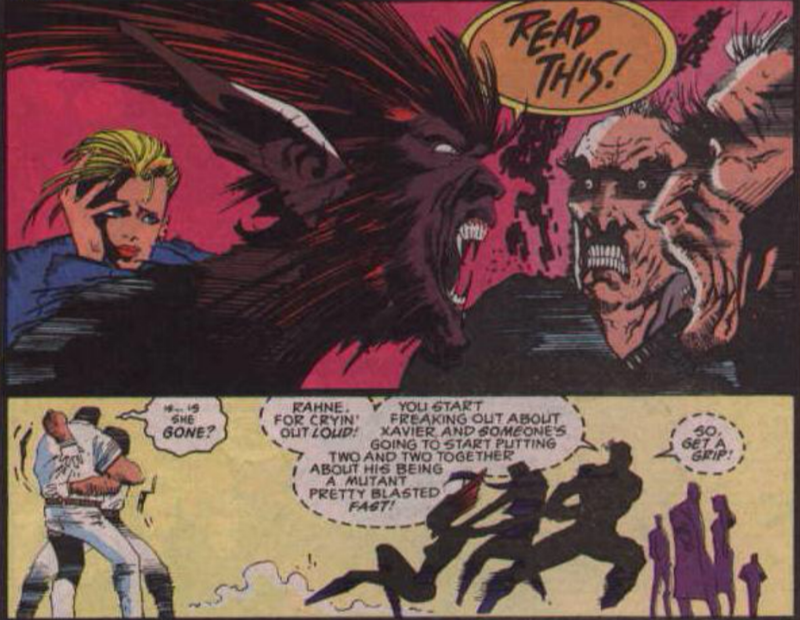 As Strong Guy calls in to Havok, Wolfsbane is reunited with her old New Mutants teammates. 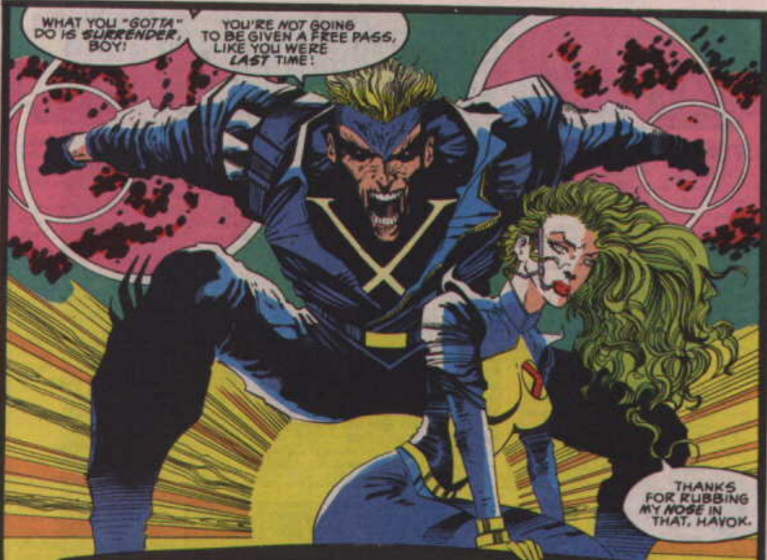 They try to convince her to join them, but she refuses, citing once again her feelings for Havok. 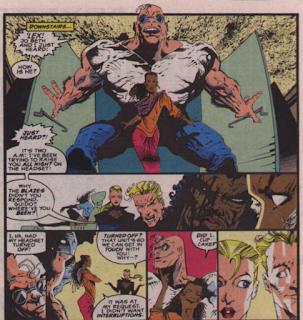 With Feral finding no trace of Cable's scent, they prepare to leave, but Strong Guy attempts to stop them, and a fight breaks out. 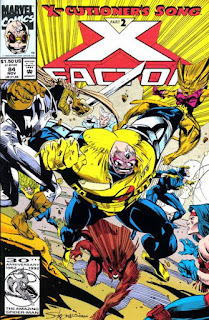 It is quickly joined by the rest of X-Factor and, overpowered, Cannonball orders X-Force to retreat. As they do, Havok blasts their ship, damaging it in order to leave a trail, in the hopes that X-Force will lead them to Cable. Meanwhile, Apocalypse's Horsemen deliver the captive Cyclops & Jean Grey to their master who, once they're gone, reveals himself to be Mr. Sinister masquerading as Apocalypse. Back at the hospital, the doctors announce that while they've stabilized Xavier, they've discovered he's been infected with something else: a techno-organic virus. 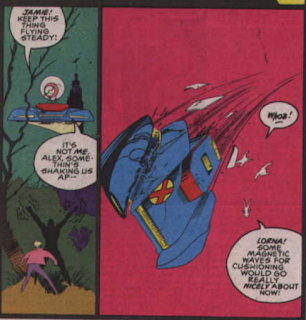 This issue advances the plot of "X-Cutioner's Song" in two significant ways. 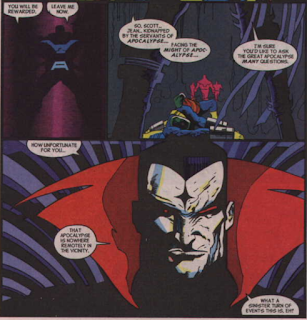 First, it introduces Mr. Sinister to the narrative, revealing that he is behind the kidnapping of Cyclops and Jean Grey, having posed as Apocalypse to get the Horsemen to capture them. One of the things the X-office wanted to do with this story is feature the X-Men's biggest (living/current) villains in one story; here, we get the second one (after Stryfe in chapter one, though we don't *know* that was Stryfe yet), representing both the X-Men (as Sinister fought both the X-Men and the original X-Factor during "Inferno") and the All New X-Factor (as he most recently appeared battling that team). Secondly, the end of the issue reveals that not only was Xavier shot, but he was also infected with a techno-organic virus (presumably via what projectile with which he was shot). 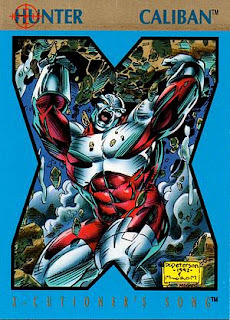 This will sideline Xavier for the effective duration of the story, and it also provides a hint towards who the true villain of the story is, and hints at that villain's true identity (since at this point the story was still being written as though Stryfe was Cyclop's son, who was also infected with a techno-organic virus and sent into the future where, it will eventually be confirmed, he became Cable/Stryfe). Jae Lee joins the series as its new regular artist, at least for the duration of "X-Cutioner's Song". I don't know, but have always assumed, that he was brought on just for these issues, a way to bridge the gap between Larry Stroman & Joe Quesada while giving the series a consistent look for the crossover. Of course, his hyper-stylized and darker work doesn't really fit the more light-hearted tone of this series, but since the next two issues of this series don't really feature the regular X-Factor characters much at all, that may be a moot criticism to make. Certainly, I'm glad Lee is drawing these issues instead of Mark Pacella. This issue features a mini New Mutants reunion, as Cannonball, Wolfsbane, Rictor and Boom-Boom are all together for the first time since "X-Tinction Agenda". Wolfsbane & Feral, the X-books' preeminent "animalistic characters with weird triangle hair" characters, meet for the first time this issue. This issue's polybagged-packed trading card is of Caliban. For whatever reason, I managed to miss this issue back in the day when I was buying this story off the shelves. So I ended up with all the chapters but this one, and it would take a few years before I could track it down as a back issue. As a result, while I've read this entire story numerous times, this remains the chapter of the story I've read the least. Val, at least, has some kind of official X-Factor badge. We're reminded that the public at large isn't aware that Professor X is a mutant, as Rahne freaks out and there's concern it'll out him. 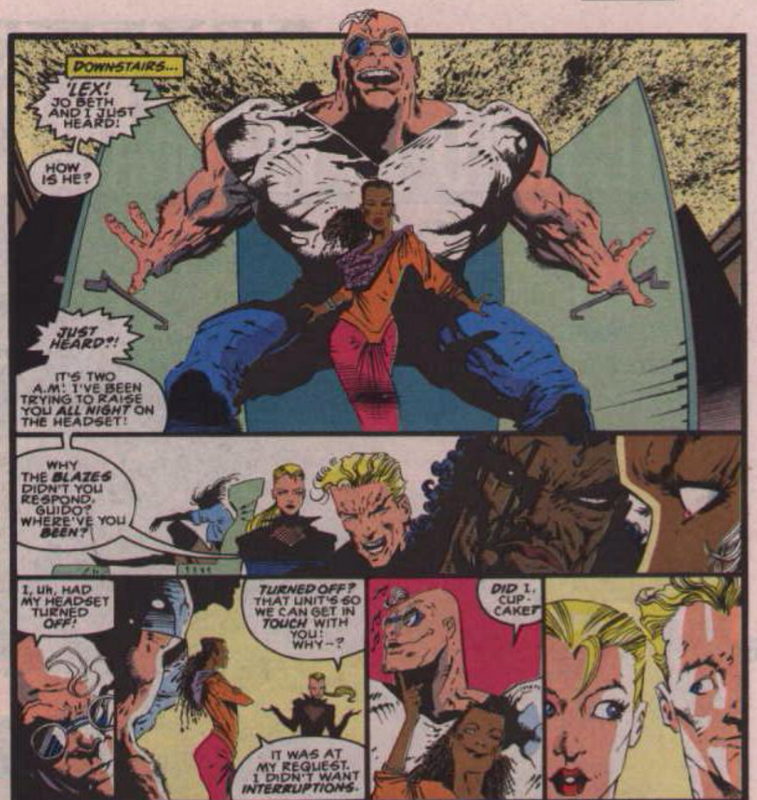 Storm and Havok meet and quickly take charge of the situation together; it goes unstated, but I was reminded that the pair actually have a fairly substantial history together, from their time together on the post-Mutant Massacre, pre-Dissolution X-Men (remember when Havok "killed" Storm?). 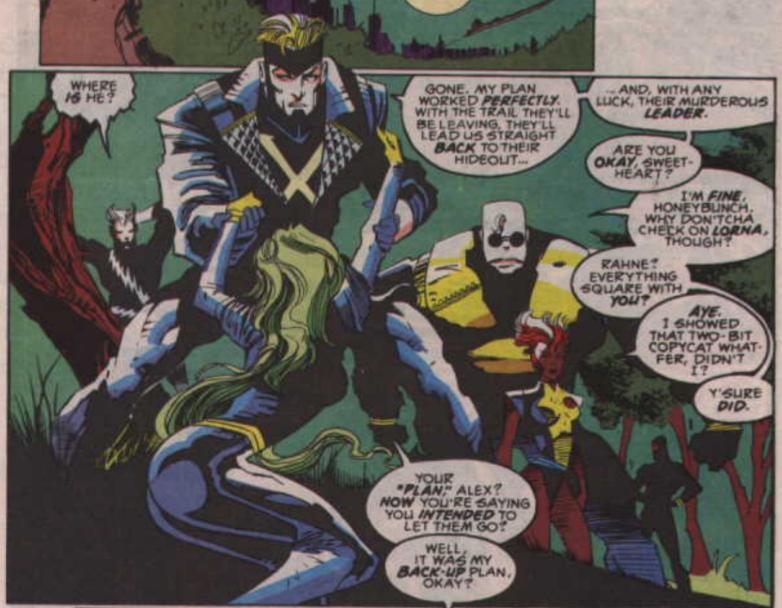 It's noted that the group of people who beat the X-Patriot Taylor outside the museum last issue have been rounded up. Investigating the scene of the concert, Wolfsbane declares that while she's not detecting Cable's scent, there is something familiar, which is a nice acknowledgement of her New Mutants past (she worked with Cable, so she knows his scent, but also fought Stryfe, so his would be familiar as well). 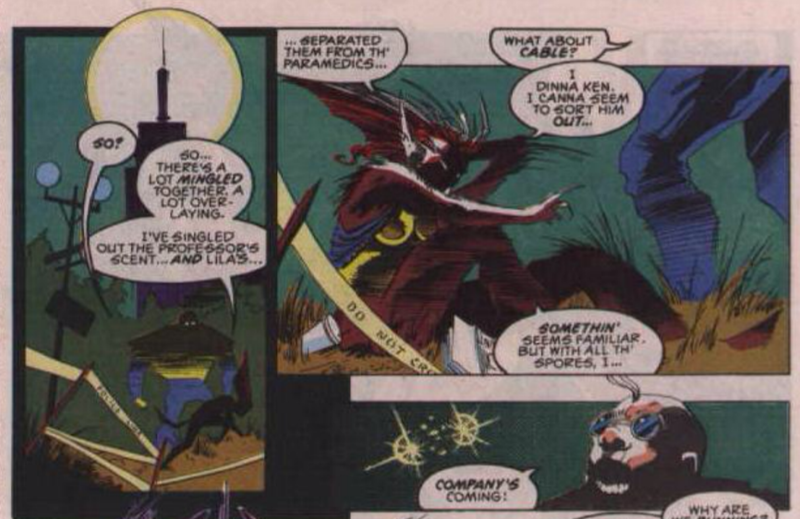 Wolfsbane is excited to learn Cannonball isn't dead, after Sauron gloated about killing him to her in X-Factor #82. X-Factor's flying car makes an appearance in this issue. 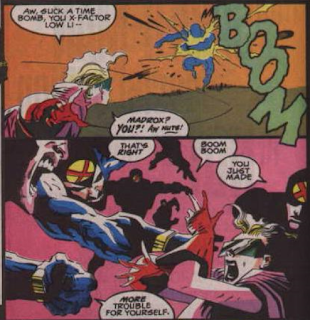 Havok references the time Polaris let Cannonball escape, in issue #77. When Madrox enters the fray, Boom-Boom is dismayed, a reference to their time spent together in Fallen Angels (that series will actually get referenced a few times in this story, leading young me to believe it was a much bigger deal than it actually was). When Havok asks after Polaris and calls her sweetheart, Strong Guy does the whole "respond when he was clearly talking to Polaris" gag. When the X-Men arrive and Beast declares they're going to help get Cable, Strong Guy makes the requisite joke about cable TV. 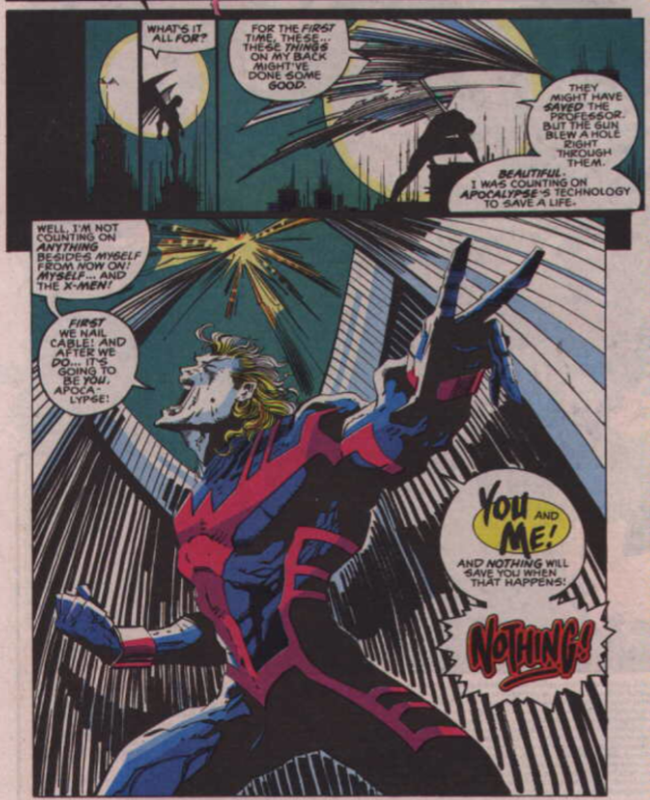 Archangel, with a big gaping hole in his wing where it was shot by "Cable", does a whole "rage at the full moon" routine, angry that Apocalypse's tech failed him when he tried to stop Cable, and declaring his intent to kill Apocalypse (despite the fact that, as far as the X-Men are concerned - and Cyclops' reminded us in Uncanny X-Men #294 - Apocalypse is dead at this point). 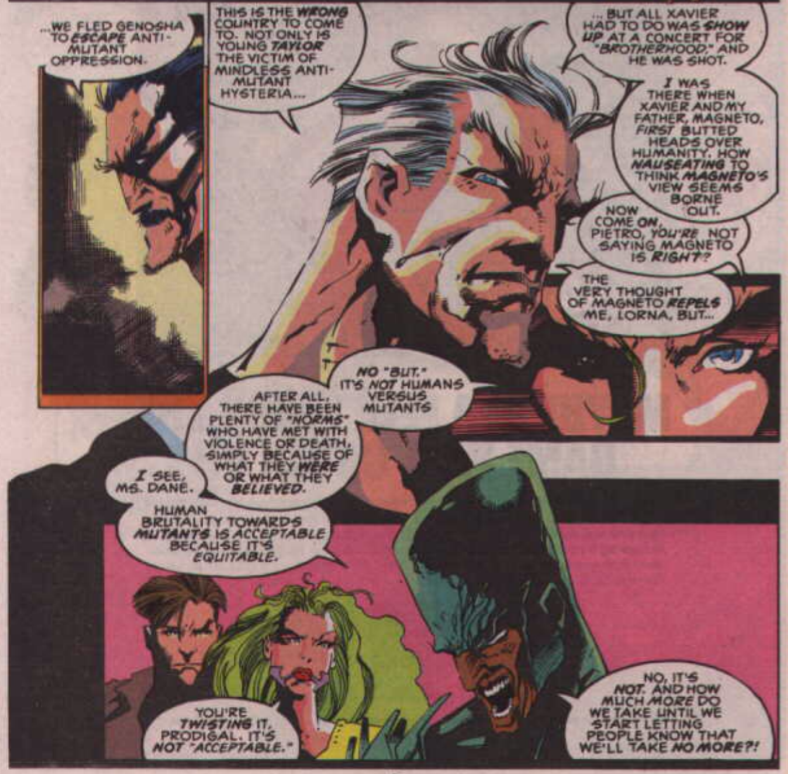 Quicksilver, Polaris, Prodigal and Lukas briefly discuss human/mutant relations, with Prodigal getting off a great line about how humanity's brutality towards mutants is acceptable because it is equitable (ie human hurt other humans who are different too). It's heavily implied that Guido and Jo Beth were knocking boots while the Xavier attack went down, which doesn't quite gel with the timeline shown in Uncanny X-Men #294 (in which Strong Guy was watching the concert and presumably saw Xavier get shot). 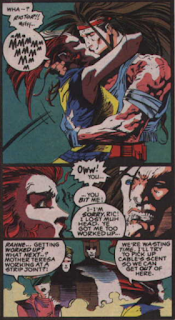 Rictor and Wolfsbane, who haven't seen each other since the latter remained in Genosha after "X-Tinction Agenda" and the former left the New Mutants to convince her to come back, but apparently got waylaid and ended up joining Weapon: Prime before throwing in with X-Force, enjoy a brief reunion. Rictor is then later sour when he learns about Wolfsbane being hung up on Havok. 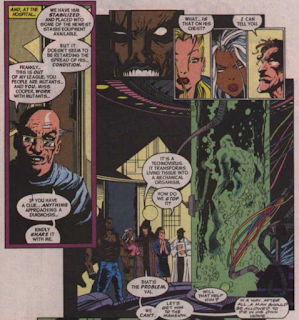 Peter David has said he left this series due to his frustrations with having his book-specific narrative interrupted in order to serve "X-Cutioner's Song", but to his credit, for this issue, at least, he manages to integrate that larger story into his own book while still keeping his characters in the spotlight. 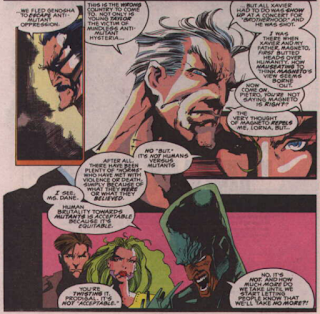 With Xavier seemingly shot by X-Force's leader, it makes sense, both in-universe and thematically, for X-Factor to be the first group to confront X-Force. X-Factor is the officially sanctioned team, and X-Force is the most explicitly-outlawed team (mostly due to their association with Cable, who at this point is still technically wanted by SHIELD, if nothing else). 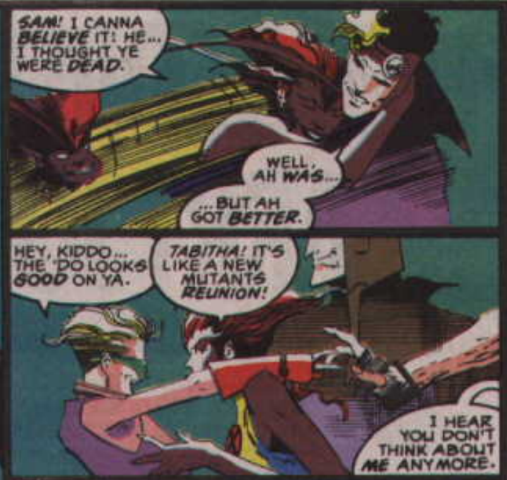 Plus, Rahne's presence on X-Factor gives this encounter some personal stakes that would be mostly absent if, say, the X-Men Blue team was the first to confront X-Factor, and it allows for a much appreciated New Mutants reunion. As a result, this still reads like an issue of Peter David's X-Factor, even as the events of the crossover swirl around it, and the interactions between Rahne and her former teammates keeps the whole thing from just being a pointless slugfest, serving character as well as plot. It may not do much to move the X-Patriots storyline along, and it's going to get much worse for David in terms of interrupting his own book, but for now, this still reasonably reads like an issue of X-Factor while also functioning as the second part of larger crossover narrative. Tomorrow, a trip down Wolverine's memory lane in Wolverine #63. Next week, another villain and another new artist make their entrances in X-Men #14, and X-Force fights the combined X-Men and X-Factor in X-Force #16. Nope, as we saw he got annoyed by the others' antics and picked up the telly and carried it to other room before that happened, and apparently then didn't hook it up but hooked up with Jo Beth instead. I know I'm easy but this exactly elevates the crossover high in my ranking. It's total cheatery to take the FoTM big boss and the Inferno big boss and Stryfe and pool them all up to up the ante, but the big guns scheming against each other with conflicting agendas is just so darn fun. They went big here, and it's magnificent. Good catch! I hadn't put that together. Also, good point on how this combines one of/the best "FoTM" boss with the "Inferno" boss and Stryfe. 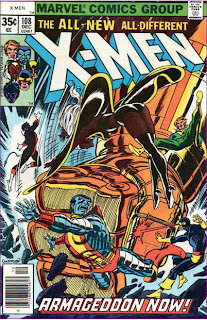 I remember realizing, months after the crossover had come to an end, that I hadn't bought an X-book since. It took me a few good moments to be ok with that. The X-Men had been a huge chunk of my life for about seven years, and suddenly they weren't. "It's heavily implied that Guido and Jo Beth were knocking boots while the Xavier attack went down, which doesn't quite gel with the timeline shown in Uncanny X-Men #294 (in which Strong Guy was watching the concert and presumably saw Xavier get shot)." 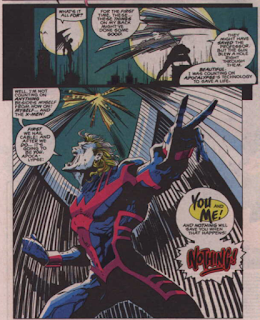 "Archangel, with a big gaping hole in his wing where it was shot by "Cable", does a whole "rage at the full moon" routine, angry that Apocalypse's tech failed him when he tried to stop Cable, and declaring his intent to kill Apocalypse (despite the fact that, as far as the X-Men are concerned - and Cyclops' reminded us in Uncanny X-Men #294 - Apocalypse is dead at this point)." And Archangel can't enjoy his denial. I just love Jae Lee's Mister Sinister in this issue. He is my favorite X-enemy because his behind-the-scene's routine. I read somewhere that was intended to bring Magneto to this crossover. Is it true? I have seen rumors as well that a Magneto resurrection was considered for this crossover, but I assume that was when Lee, Liefeld and company were still involved and it was called "Sins Past", and then the idea got scuttled after they left and something else had to be done. These days the title "Sins Past" will make most Spiderman fans, reach for the drinks cabinet. I couldn’t figure out for sure who that was supposed to be. My best guess was Gambit, due to the brown trenchcoat and inability to discern hair against the shadows there, even though the word balloons didn’t read like him — i.e., knowing what the technovirus was; referring to Val as, well, “Val”. Ah, yeah, I remember the confusion over that! I should have mentioned that, especially since it took me a moment to remember that was supposed to be Archangel. Hmm, I just realized I somehow missed this one last week. I think this may have been my introduction to Peter David, and I really enjoyed the humor he brought to the proceedings even as he kept it all suitably melodramatic, too. 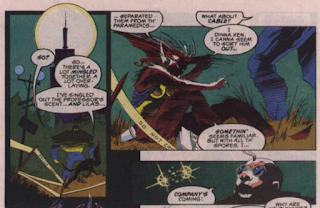 This was also my introduction to Jae Lee, who impressed me much, much less. Some of his stuff looks fine, and there's this great shot near the end of the issue of Wolverine, Psylocke, and a few others looking really dramatic, but overall I don't like all the shadows he uses everywhere, a lot of his characters look downright bizarre (see the various doctors and orderlies all over the place this issue or, even better, Havok in the "And your associates?" panel you posted above), and some of his exaggerations (such as fifteen foot-tall Guido standing behind Jo Beth when they burst into the hospital) just drive me nuts. I will say, as I much as I kinda like Lee's art in places in this story, in a vacuum, it's really jarring compared to the other three artists, who are all unique but still generally of the same style. 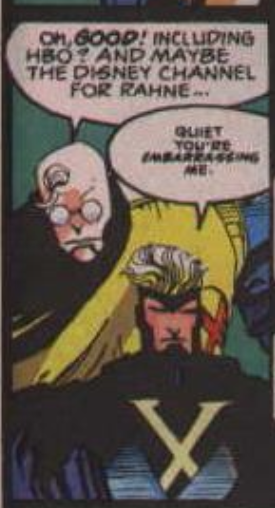 I like the idea that when Havok is around his former X-Men teammates (his serious friends), he's embarrassed that he's now leading a team with a bunch of clowns. Also, it was great at the time, if you were a fan of X-Factor, seeing PAD's comedy team beat the crap out of the "extreme" X-Force.